Tara and John met on-line, Tara “winked”, John emailed her, a date was set to meet at Sunset Beach in Cape May to stroll around town, grab a drink at Congress Hall Hotel and dinner. The date lasted 8 hours and the rest as they say is history! John and Tara started dating and quickly learned that they are book and beach lovers. Tara found John to be energetic, full of life, and industrious. John found Tara to be an old soul who loved anything Jane Austen, flannel nightgowns and bubble baths. Together they found that they loved to laugh, act like kids, ride their bikes, and go on adventures. John stood by Tara as her mother battled breast cancer and still battles the disease. In John, Tara found her knight. During their time dating, Tara landed her dream job in Cape May working for Cape Resorts Group at the Virginia Hotel, and today she is the General Manager of the Virginia Hotel and John owns and operates his own IT company in Philadelphia. Together they pushed each other to achieve their goals and dreams. Congress Hall was the spot where Tara and John had their first date and their first kiss! It was a place that they visited and came to love and the icing on the cake was when Tara was hired by the company. On May 1st 2013 John woke up and decided that would be the day he would propose to Tara, he drove to the beach, picked up the ring that he had on hold at the West End Garage, a beautiful 1.5K ring from the 1950’s that fit Tara likes Cinderella’s glass slipper. The store was closed! He had to get the ring and he had to get it that day; he spoke to everyone in the company to help him get the doors open so he could get the ring! As he ran around and ran late for a date with his soon to be fiancé, he called and said “Tara, come out to the lawn at Congress Hall”. He showed up racing up the driveway in his car with his dog hanging out the window barking. He jumped out of the car, grabbed Tara’s hands and walked her to the great lawn–where he dropped down on both knees and asked “will you marry me” and Tara said “yes yes yes”! Deciding where to get married was easy. Tara and John knew they wanted to get married at Congress Hall, since it played such a huge role in their life; it was their respite, the place they dined, the place where they sat on the rocking chairs for hours talking, and the place that was their home. They wanted all their friends to come and experience their life at the beach, to see this beautiful seaside hotel they always talked about and to experience the beauty of Cape May. Tara knew she wanted to be surrounded by her family, her friends and her work family whom she had come to adore and who had become such a big part of her life. Tara also wanted a farm-to-table menu with ingredients from Beach Plum Farm in a stately elegant setting. The theme was “simple, classic and a little shabby chic”. Tara wanted to play off the great black and white tile floors, the gorgeous ornate black chandeliers and the tiffany blue walls. Her color palate was blush pink, black and white, guests were encouraged to dress formally. Tara’s gown was a Vera Wang strapless tulle ball gown and two tiered walking length veil and Garza floral sash in pink around her waist that floated when she walked. 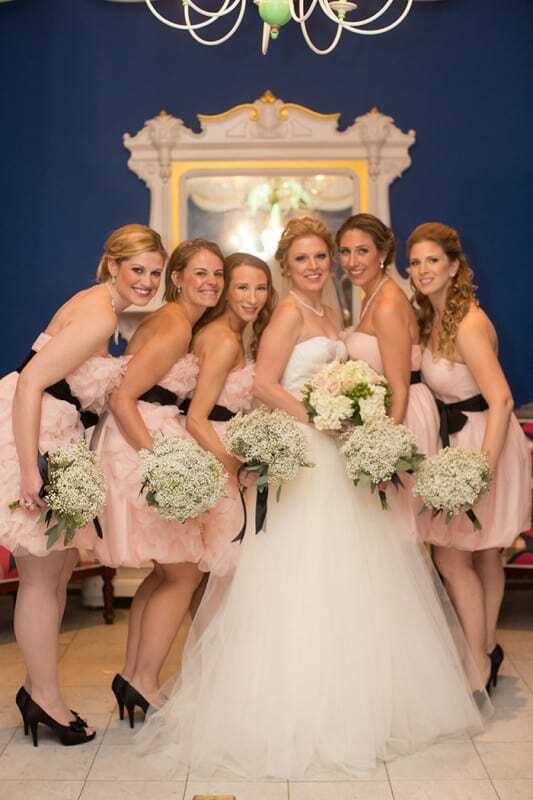 The bridesmaids wore blush pink Vera Wang dresses. Her “something borrowed” was her mother’s diamond earrings, her “something blue” was her garter, her “something old” was her great grandmothers beaded purse, and her “something new” was her dress! Her favorite part of her wedding was when Blue the Pig (the mascot of Congress Hall) showed up for pictures. Tara loves Blue for bringing a smile to everyone’s face! Tara would describe her wedding as magical; she walked down the aisle with her mother and her father who is blind and she was surrounded by so much love as family and friends clapped and cheered. The moment she will never forget is walking in and seeing her husband’s face and when she said “yes” before the officiate even asked–and the crowd erupted in laughter! If she was able to change one thing, she wished that she could have spent more time with everyone. John and Tara had friends from all over the country and abroad that came to celebrate with them, and celebrate they did. The party never stopped; everyone danced until their feet hurt. John and Tara walked into to reception to their favorite song by Billy Joel “Uptown Girl” and if John could have he would have driven his motorcycle in with Tara on the back! Their first dance was to Stevie Wonder’s “Signed, Sealed Delivered,” and Tara danced with her father to “To Sir With Love”. Tara’s advice for other brides is take in each moment–relish in each moment. Take a few moments after and sit with your husband and celebrate in this amazing adventure and soak in the love you have for each other. Do not get stressed about all the details, it is a wonderful day in your life and the little details do not matter. The big finale was when John sabered a bottle of champagne! The couple honeymooned in Antigua and split their time between their home in Philadelphia and Cape May.